The Most Mind-boggling sculpture of Tanjavur Brihadeshwara Temple. You are here: Home / Culture & Society / The Most Mind-boggling sculpture of Tanjavur Brihadeshwara Temple. The most auspicious temple for every Hindu people is Brihadeshwara temple. It is considered as the most sacred temple in South India, and mostly for Tamilians. Brihadeshwara temple, is also called as Rajarajeswaram kovil and peruvudaiyar kovil . It is a Hindu temple dedicated to Lord Shiva located in Thanjavur , Tamil Nadu, India . It is one of the largest South Indian temples and example of fully realized Tamil Architecture. It was built by Raja Raja Chola 1 between 1003 and 1010 A.D. The temple is a part of World Heritage Site and is known as Great Living Chola temples, along with the Chola dynasty era Gangaikonda Cholapuram temple and Airavatesvara temple that are about 70 kilometers and 40 kilometers to it’s Northeast respectively. Considered a marvel and miracle in the history of temple construction, the temple houses a huge Shivalinga in it’s sanctum justifying the name Brihadeshwara (the all-pervasive Lord) .The whole of the temple is constructed from granite stones. Expert architects marvel at how the octagonally shaped capstone weighing about 81 tons was lifted and placed on top of the hollow Shikara measuring 216 feet(66 metres). The 216 feet Vimana is notable as one of the tallest man-made Shikaras of the world. The Chola King Arulmozhivarman, praised as Rajaraja Chola 1, was a great conqueror whole ruled the entire South India, Ceylon , Malaya and Maldives islands. Laying the foundation for the temple following the orders received in his dream and accomplishing it around 1010 A.D., he named the temple Rajarajeshwaram. 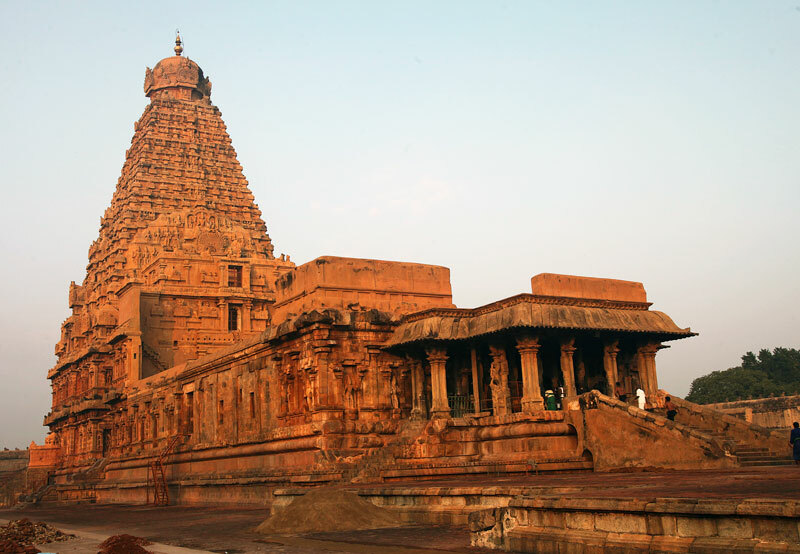 While none of the massive palaces built during the history of Chola survives today, the fact that Brihadeshwara temple has managed to stand the test of time for more than a thousand years proves the superior accomplishment of Chola architecture and the patron’s incomparable devotion for Lord Shiva.